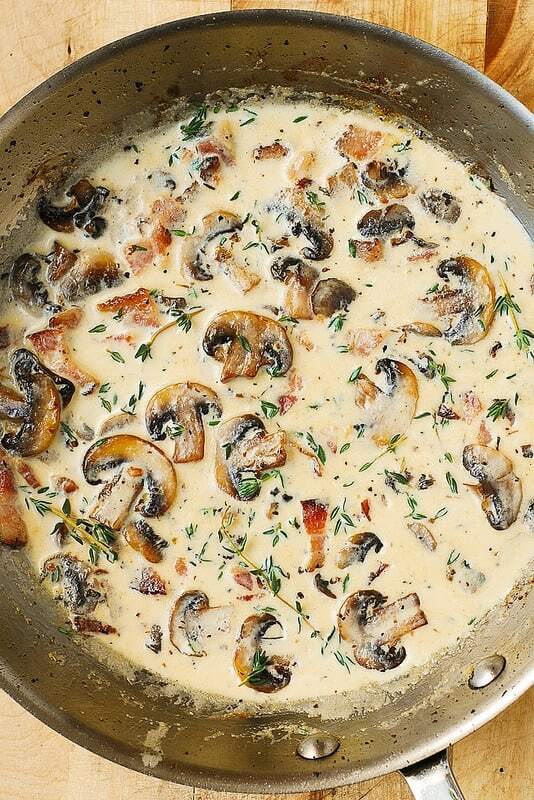 Creamy Mushroom Sauce with Bacon and Thyme – one of the best ways to cook mushrooms! Gluten free, low-carb, KETO friendly side dish and/or sauce. 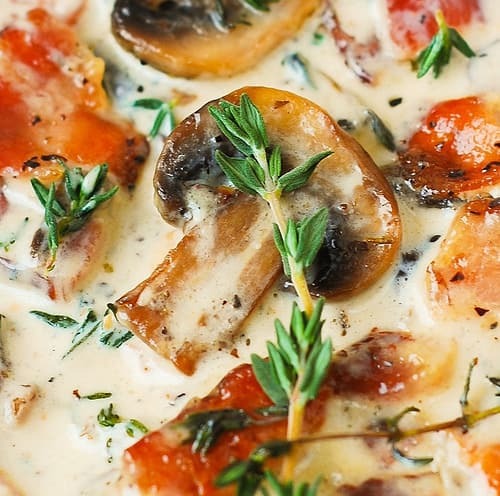 Mushrooms, bacon, thyme and cream create an excellent flavor combination: very savory, perfectly seasoned. 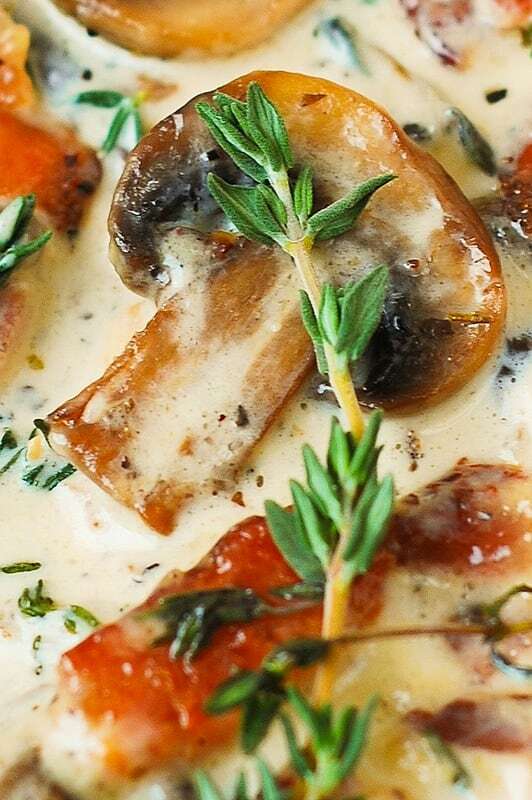 This creamy mushroom thyme sauce with bacon makes a great accompaniment to grilled meats, chicken, pork, steaks, etc. I love easy recipes and this one is no exception. Add heavy cream, salt, snipped fresh thyme, bring everything to boil, then reduce to simmer and simmer for about 2 minutes for the flavors to blend. Remove from heat and add more salt if needed. That’s it! Your sauce is ready to be served! 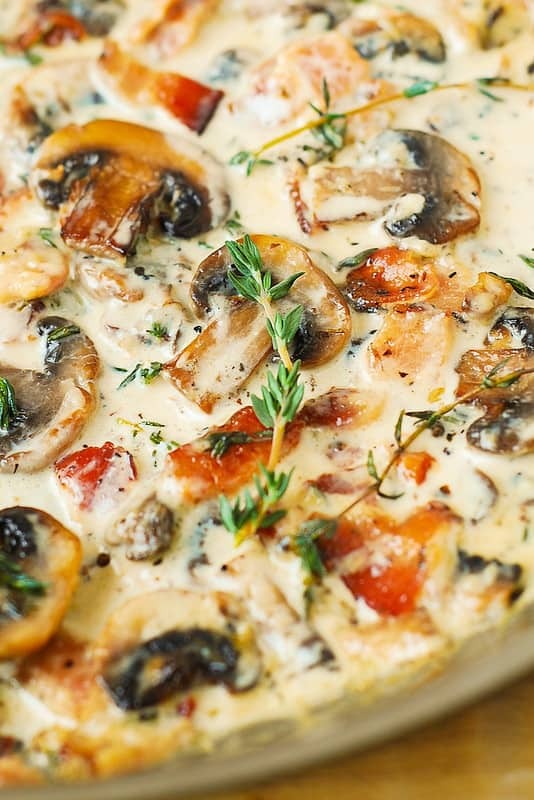 Creamy Mushroom and Thyme Sauce with Bacon - Gluten free, low-carb, KETO friendly side dish and/or sauce. Perfect side dish for grilled meats. Heat olive oil in a large skillet on medium heat. 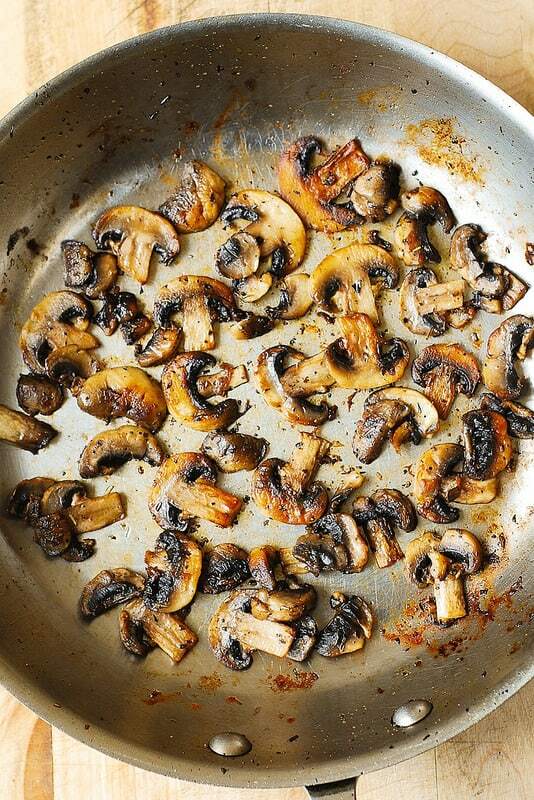 Add sliced mushrooms (without salting - to ensure they mushrooms get caramelized) and cook on medium heat for about 3 minutes flipping once. The whole recipe makes about 4 servings. Delicious additions! You made a whole dinner out of this sauce! This will be my go to sauce now! SO YUMMY! You could. That’s not a bad idea. Some types of the bacon have so much fat, I prefer to cook it and drain all the fat before I use the bacon. 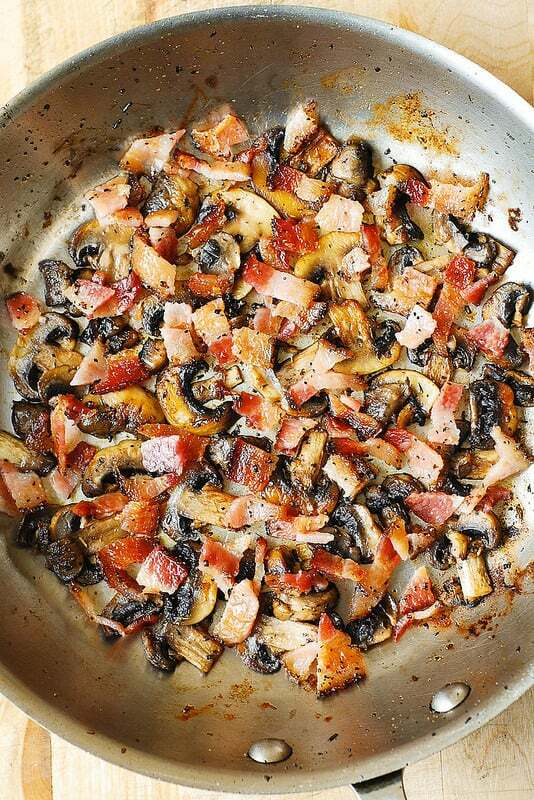 But some bacon does not produce as much fat during the cooking process, in which case you can cook it together with mushrooms. You’re so welcome! I am so glad you’ve made this recipe and that your family enjoyed it. I love thick-cut high quality bacon. Potatoes go great with creamy sauce like this one. Great choice! Anything with mushrooms is a winner in this house Delna’s idea with the pasta works great with this house! Or over chicken or pork chops! I know this will be tried maybe on my next day off…I work 4 pm to 1 am! I love this recipe but tweak it a bit by adding cooked pasta — the kids love this !! Mary, I’m not the author/creator but if you’re looking for nutrition information for any recipe, you can input the recipe into MyFitnessPal (you’ll have to create an account if you don’t have one) and it’ll tell you all the nutrition information you could want.